Originally my plan was to go one by one through the six free sample pints that Enlightened kindly sent over for review. See, while my area does have Enlightened bars available, I have yet to see the pints that they released at some point. 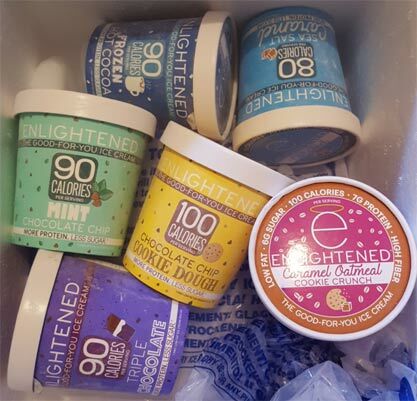 The pint containers were originally clear but in the last few weeks Enlightened has let the world know that they have new colorful pint designs to get your attention. Basically they look more like Halo Top and less like Talenti now. Itty bitty oatmeal cookie bites, how cute! I take a few small bites and realize the aftertaste is that of oatmeal cookies dunked in milk. I can approve of that. I've had a hard time getting a good read on the caramel swirl. It's not super rich or buttery, instead it's more tame as you might suspect in a healthy option like this. I've eaten a fair amount of this and I'm not sure how I feel about it. Don't get mad yet though, hear me out. There is a good amount of bits and swirl, so that is a positive. Compared to other options I've tried that were only a base flavor with no bits or swirl, this is a definite improvement. The texture also isn't bad. It's fairly dense and fairly solid, but it's not scaring me away either, I believe I can adapt once I try a few more flavors. One of the"secrets" to Enlightened being a more healthy choice is that they use erythritol instead of sugar. The other one is that cream is the #4 ingredient behind milk protein and corn fiber. The good news is that skim milk is the number one ingredient instead of water like Arctic Zero. The bad news is that while erythritol is one of the more digestive friendly sugar alcohols out there, I unfortunately still seem to have an issue with it. See, originally I was going to review a different pint everyday, but my system decided otherwise (so I guess I will be avoiding Halo Top as well). For now, I'm just going to throw out a quick few thoughts on two of the other flavors I tried. I'm sorry to do it this way and I send my apologies to Enlightened. I guess I've just never been very good with sugar alcohols. The cookie dough flavor sure looks fun enough, but I wish the brown sugar flavoring was much, much louder. It just doesn't taste vastly different than the other two Enlightened flavors I've had. That said, you can flip that and say that if you like their other flavors then I suspect you would like this one as well. My very first impression is something akin to a Jell-o pudding pop. On the second bite I got a little too much of the fudge sauce. It's something akin to Hershey's but felt a bit more potent. Wow, it gets really dark in color if you mix it all together. Now I picked the triple chocolate to see if it would override that kind of taste/texture that has driven through every Enlightened product I've tried, but it did not. I still know this is Enlightened. It makes sense and may even seem overly obvious to some, but it never hurts to verify that the taste never really overrides that base construction of "the good-for-you ice cream". Ok, that's it for now and I now open the floor for comments. It's certainly a neat looking product with some positive nutritional stats, but is that enough for you? Have you tried Enlightened yet? Will you try it? Do you enjoy the bars and hope to find the pints soon? Or have you tried it and found that you prefer Halo Top or Arctic Zero instead? Let us know! 2017 Update: I've haven't gone back and tried any more flavors, but since a lot of people are still clicking on this review, let me tell you what Enlightened is currently rolling out: Birthday Cake, Bananas Foster, Fudge Brownie, Red Velvet, Black Cherry Chocolate Chip, Strawberry Cheesecake, Cold Brew Coffee, Snickerdoodle, Brownies & Cookie Dough, Pina Colada, Toasted Almond, Chocolate Peanut Butter, Vanilla, Chocolate, Butter Pecan. If you want check out some reviews and photos, head on over to JunkBanter's instagram. curious, what in particular swayed you? The comparison to pudding and the erythritol (plus still having sugar, even with that!) - it gives me tummy sounds. I was still willing to try it, but I think the pudding comparison was the end! Would love to try the oatmeal one! I have a stomach of steel so fake sugars don't bother me at all. I've never seen this in any local store though. May I ask what store you found it in (I realize you live in New England) or did the company send them to you? As long as they are not too expensive and not similar to Arctic Zero, I would probably really enjoy. I'm also desperate to try Halo Top! Also hard to find in my area and think it will be out of my budget. An ice cream lover can dream. Did you let the pints sit out and thaw for about 10-15 minutes before this review? I ask because I eat these ALL the time and notice it definitely improves the taste and texture! Sometimes I'll be impatient and microwave it, but thawing it is the way to go! As for your comment on erythritol, I may eat these nearly every night but it certainly doesn't agree with me either and I know a lot of people who have issues digesting it so I'd love to know where the claim of it being more digestible got its foothold. My personal favorite is the oatmeal cookie followed by the triple chocolate and s'mores, the others are good but not nearly as good as those three. I personally miss the older pints because I enjoyed seeing the swirls, hopefully these newer pints don't mean there will be any less of them because I always thought the transparency was their way of showing it off (so you wouldn't be stuck with a Ben & Jerry's-type pint "core" where it ends and you're left disappointed). Anywho, I can't wait to hear what you think of these! I tried the salted caramel bar only once (not normally an ice cream bar person) and I ended up spooning it off into a small bowl and adding a shot of espresso to make a delicious salted caramel affogato. Yes, I'm obsessed. I love Enlightened. @Anon: they did indeed send these over as I only have the bars in my area. If you are having trouble finding them, maybe try something like whole foods. As for Halo Top, they are really expanding and becoming much easier to find. Both Market Basket and Wegmans carry it now. I'm trying to remember if I've seen it at Stop&Shop (Giant) yet. @Caitlin: I did indeed wait quite a bit to let it temper (melt), but you've been around awhile so you know I can be tough on the texture of products. As far as the erythritol claims, it was something that popped up on the internet though I didnt do any long winded research. Even though it still gives you trouble, do you think it gives you less trouble than when you first started eating it? You would hope/think that your system would develop a tolerance to it over time, but maybe not. Oh, as far as I know the recipes havent changed, just the packaging, but I can ask them just to be safe. I think the oatmeal cookie is good - and the product is good for what it is. That said, I think I would rather eat a small portion of excellent ice cream than a pint of healthy "ice cream." Halo Top and Enlightened are light enough that you can easily eat the whole carton ... not worth the calories. I do think oatmeal cookie is one of the better halo top flavors. It's too bad orhernajor brands don't make that flavor. I grieve with you over the death of Oatmeal Cookie Chunk! That was my favorite ice cream of all time and I'm still not over the loss of it. I'd certainly be interested if the ingredients changed though, as I find it odd they would get rid of the transparency. Perhaps they stick out more, but I don't know, I personally find it more cluttersome on the shelf and liked seeing the swirls of what I'd be diving into that night. of flavor, makes is much better IMO. I do not have the patience to wait 30 minutes for a snack let alone 30 seconds. I get what you are saying, that's how a lot of people roll, but many of us can't wait. Question: do you then proceed to eat the whole pint? or do you put back the half melted remnants in to the freezer for another time? I guess in theory if you let it melt every time then you wouldnt be as bothered by any odd textures created when you refreeze the ice cream. I personally do not like refrozen ice cream. I have nothing against devouring the melting edges of a pint, but I do my best to not let the whole pint out too long (I'm a quick eater). You could even get in to the argument that you might be more tempted to eat more of the pint as opposed to when you kind of put a mental clock on getting it back in the freezer. Hope that all makes sense. I've tried a bunch of these and Halo Top/Artic Zero. I put Artic Zero in another category because the base is completely flavorless, and the only thing that saves it (not really) are the chunks in the chunky pints. 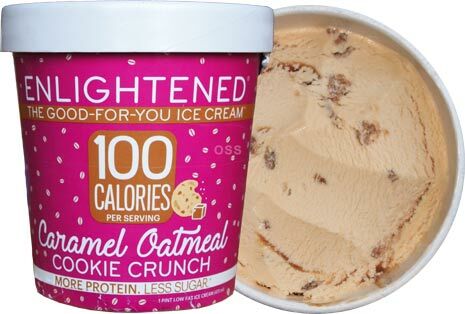 My issue with Enlightened is that there's just a strong artificial taste, and the calories really are not much lower than Eddy's slow churned... so I'm not sure it's worth it (yeah sure, they have more fiber and protein but in truth they are really not more filling). With every bite I just can't help tasting it, and it's a turn off. Halo Top is completely hit and miss for me though. Sometimes it's really tasty, and sometimes it tastes completely artificial too... It can happen with the same flavors as well! My first vanilla pint was awesome, the second one tasted completely artificial... same thing for the new salted caramel flavor, which other people are raving about, but I can't even finish it (and I love caramel ice cream!). I'm starting to think that there are some qualify control issues there, I contacted them and their only answer was 'to let the ice cream soften' (which I always do anyway). I'm probably just going to take a break from those 'better for you' ice creams for a while, I think (unless it's that time of the month and I really need to devour a pint of ice cream, then maybe). Erythritol gives me issues occasionally as well, but it seems as random with Halo Top as the artificial flavor. Oh and I just put my pint in the microwave on the 'soften ice cream' setting for 35 seconds. I'm guessing it's 10% power? It works really well. only other low sugar ice cream I have eaten is the Breyers one... forget the name; I like it but it only has a few flavors. That said, I am not an ice cream fanatic, but I am crazy for chocolate so when I saw the "triple chocolate 90 calories" in the store and the reverse side had low sugar and low fat, I brought this home. I tucked it in the freezer and forgot about it for a few weeks and then tonight I was scouting around for desert. It is really chocolatey. Yes, the fudge sauce is practically black. 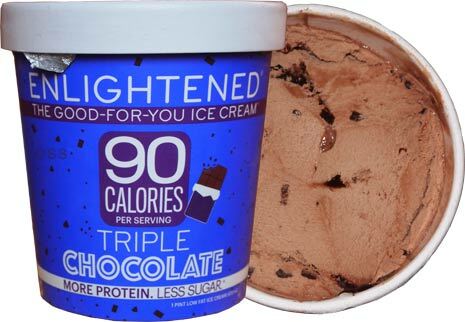 The texture is not exactly like other ice creams, but for a devoted chocolate fan, I thought this was a good taste without a bad calorie count or a big sugar hit. I am sort of 50/50 with sugar alcohols. I ate about 1/3 of the pint, so we will see how that goes with my digestive tract. I am usually OK if I have them in moderation. @C: I don't mean this in a mean way, but I am curious if you will feel the same way in 24 hours :) I am glad you enjoyed it, do you think you will try other flavors if your system doesnt mind it? We got a coupon for a free pint. We tried the triple chocolate. That's the only reason we tried this. We rarely have ice cream in the house, but when we do it's usually high end like Hagen-Dazs. It was extremely firm and scooped with difficultly. Once scooped we waited till it was starting to show minimal melting before eating. After an initial bite, we decided to try and mask the taste with chocolate syrup; that didn't help. I have never thrown away ice cream before, that didn't have freezer burn. But there is a first time for everything. This bears no resemblance to ice cream. 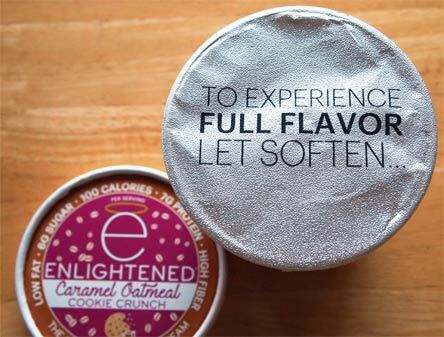 I love Enlightened ice cream. The triple chocolate is my all time fav. I love the valleys of chocolate syrup. I wish this came in a larger size and less $$. It's very $ unless you hit a sale! Wish they'd send me one of every flavor!! The 60 calories a serving pints (toasted almond, snickerdoodle) taste like sadness. Am I supposed to take it out from the freezer and wait until it melts a little? I did not do that and it does not taste very good. It's like ice flakes and there's not that much taste to the Vanilla ice cream. I don't see this brand selling a lot. Does not taste like ice cream. I tried it for the first time today and decided to Google and see what others said. Not very good in my opinion. Yeah, you really need to let it sit out for a bit, and even then, it won't be ice cream, it's just sold in the ice cream section. This is meant to be a healthy alternative to ice cream. I've enjoyed several flavors, I'm normally a bit gassy so I don't notice the GI issues much, love the idea that it's High Fiber! Yes, it improves if left to thaw for like half hour, not kidding. Horrible . First time I have ever thrown ice cream away. I agree with the nay sayers. The consistency was strange (lumpy not smooth) even after letting thaw, the aftertaste was unpleasant. I covered it with chocolate syrup then it was just so-so. I tried the triple chocolate since I'm a chocoholic, no 'valleys of syrup' in my pint and not very chocolatey. Curious about which ingredients provide the fiber listed. I tried the Mint Choc Chip (4 spoonfuls) and the. next day had the worse abdominal cramps of my life. The flavor was good but unfortunately not worth the pain and illness. I bought this yesterday - cookie dough and mint chocolate chip. I didn't read the ingredients and just assumed they used less sugar and perhaps skim milk or something to that effect. It tasted horrible - very gummy - I tasted the "gummy" more than anything else. The worst part is that I have been deathly sick since last night. Granted I am lactose intolerant but have never been this sick and for this long. If I knew they were using sugar alcohols I would have never bought it as this also makes me sick. 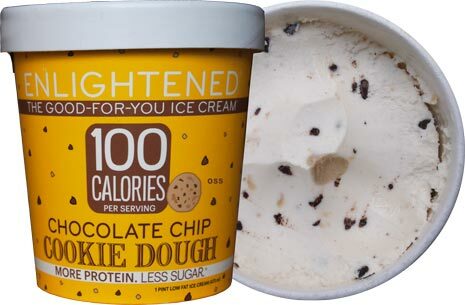 I have eaten low calorie ice cream and what they used to call "ice milk" along with frozen yogurt and other products - including dairy free ice cream but this without a doubt was horrible. Publix was selling this as BOGO which might explain the pricing - still -read the ingredients before purchasing and even if you do not have any food allergies, there's no reason for this to taste as bad as it does. Sorry to be negative - I'm not a troll. I bought the Sea Salt Caramel flavor a few days ago. I am eating some now after I let it sit out for 20 minutes. It's still pretty hard. The texture is very strange. The comparison of frozen pudding seems about right. It's definitely not like normal ice cream in that it's not melting much. For this reason, I would recommend Halo over Enlightened.